Commercial property to let. ( Part let can be considered.) A Market Town in Central Wales completely unspoilt countryside within 16 miles of the University Town and Seaside Resort of Aberystwyth and 8 miles of the Market Town of Lampeter. Available to let with immediate occupation a useful commercial property refurbished to provide ground floor lock up shop 850sqft open space. First floor office suite with four offices reception area and attic workshop/open plan office. Useful additional trading area to include gravelled patio area with deep enclosed lawn garden. Disable compliant. In prominent town square location next door to the popular Spar shop. 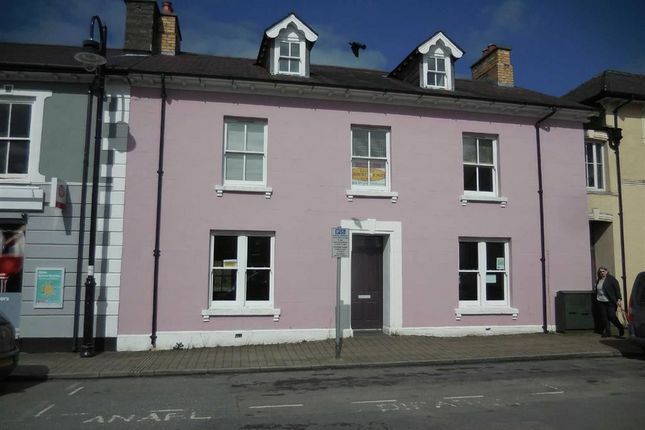 The property occupies a prominent town centre location facing the monument of Henry Richards and next door to the Spar Supermarket and diagonally opposite Rhiannon Welsh gold centre of this popular Market Town. Tregaron is enjoying an ever increase in popularity and favoured by anglers fishing being obtained in the Rivers Teifi and its tributaries together with the increase in popularity by visiting ramblers and bird watchers especially at Cors Caron the home of the red kite. The surrounding countryside has a wealth of natural beauty and the land lying to the east is totally unspoilt and provides some of the most picturesque scenery in the principality. The Cardigan Bay Coast is within easy reach and Tregaron has the benefit of being unspoilt countryside yet close to the sea. The main construction is of solid stone walls with a later two storey rear extension built of concrete block. The roof is pitched and laid with natural slate. All windows have been replaced with modern traditional style timber casement double glazed units. The property has been subject to major refurbishment works in recent years to provide a modern commercial entity compliant with current standards and regulations. The accommodation provides a ground floor retail space other use subject to planning with integral and separate side entrance to the upper office suite. The accommodation comprises as follows. With door to outside and stairs and passenger lift to first floor. With low flush WC, wash hand basin, Worcester oil-fired boiler which heats hot water and central heating. Approached by separate entrance door adjoining the square leading through a covered access way to rear ground floor communal reception area. With window to rear, double panelled radiator, single power point and 2 twin power points. With window to front, double panelled radiator and 3 twin power points. With panelled radiator and 2 twin power points. With window to front, panelled radiator and twin power points. With single drainer stainless steel sink H&C. With 2 dormer windows to front, 2 velux windows to rear adding natural lights, 4 double panelled radiators, 3 twin power point, eaves storage cupboard, feature exposed timber a-frames. Rear garden partly laid with paving slabs ideal seating area. Mains Electricity, Water and Drainage. Oil-fired central heating system throughout. Telephone subject to BT regulations. The Lessors are prepared to negotiate a new Lease on a 3-5 year term on exclusive basis or alternatively may consider letting in part i.e. Shop separate from the upper office suites. The property provides a good mix of commercial concern, ideally the ground floor will provide suitable retail outlet. This is an excellent opportunity for prospective tenants seeking a large premises with a good prominent position. For further details apply to Lloyd Herbert & Jones who will be pleased to arrange a viewing. Property descriptions and related information displayed on this page, with the exclusion of Running Costs data, are marketing materials provided by Lloyd Herbert & Jones, and do not constitute property particulars. Please contact Lloyd Herbert & Jones for full details and further information. The Running Costs data displayed on this page are provided by PrimeLocation to give an indication of potential running costs based on various data sources. PrimeLocation does not warrant or accept any responsibility for the accuracy or completeness of the property descriptions, related information or Running Costs data provided here.